How ready are you when the movers arrive? Are your belongings packed in stackable boxes? Can the truck park close to the house? What can be done to improve the access? Have you eliminated unwanted or excessive items? 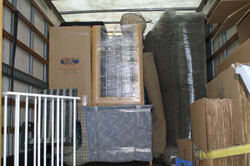 Moving entails so much more than shipping your belongings from house to house. Use the following timeline to insure an easier moving experience. Tour your house and decide which items, if any, might be discarded donated. Consider a a garage sale. Movers cannot take aerosols, flammables, corrosives or ammunition. Use them up or give them away. Propane tanks and lawn mower fuel must be emptied. Notify the Post Office and get change of address forms for each person receiving mail at your address. Notify subscription services of the address change. Defrost, clean and dry refrigerators. Strip the beds but leave them intact. The movers will dismantle them. Tour your home with the movers so they can assess the shipment and determine the most suitable routes from the house to the truck. Be available all day to answer questions, direct the placement of your furniture and boxes, sign the bill of lading, etc.